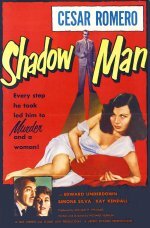 They used to churn these pseudo film noirthrillers out by the van load in the early 1950s with varying degrees of success. This one moves along at a brisk trot, but basically there is little else to commend it apart from a workmanlike performance by Cesar Romero as a casino owner madly in love with the ill-fated (she died of leukaemia in 1959) and consistently underrated Kay Kendall. Kendall frequently had a strange luminescent quality on screen and this film shows it to moody advantage.